Yes, I am a novice at this. Now you have the pictures. Hi Sue, that's much better! Now I can tell you what your plant is! 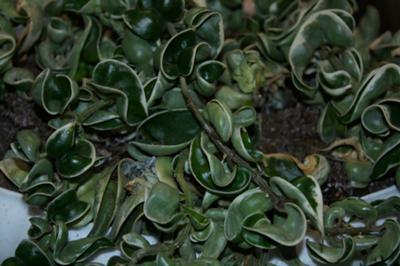 This is one of the neatest plants, and you'll find that it's easy to care for, and won't give you any trouble. It's Hoya 'Krinkle Kurl' or the Indian Rope Plant - what a great name. Hoya are known for their long tendrils of new growth, with widely spaced leathery leaves - this plant is much more compact, with the odd shaped wrinkly leaves. 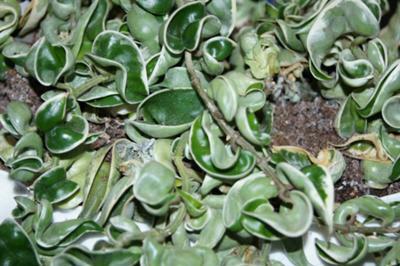 This special variety requires the same care as other Hoya, although you should keep an eye out for mealy bugs, which can hide in the curled up leaves. They're easy to propagate, simply cut off a four to six inch length of stem, and put it in a jar or water on the windowsill. They'll root, and you can carefully pot them up into regular potting soil. 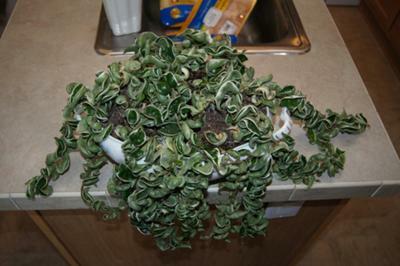 Give the plant the occasional good drink of tepid water, and then allow it to dry out quite a lot in between. In time, this treatment will prompt it to bloom. 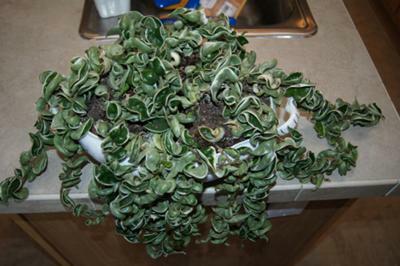 They like to be root bound, so don't be too eager to repot it, and they dislike being moved. Once they've adapted to your climate, they're usually quite easy care happy plants and will bloom. The flowers are highly scented, and look as though they're made out of pink wax - which explains its other name of Wax Plant. Many families pass along their Hoya carnosa 'Krinkle Kurl' for generations - often, people will inherit great grandmothers plants (or a cutting) which makes some of these plants over a century old. These can also be found in a variegated form, which I don't like quite as much, as well as their unfortunate trend of reverting to either a completely white leaf colour (which will eventually kill the plant) or just back to the plain green form. Good luck with your great plant!